It’s a bit of a struggle to get comfortable right now,” says Tony Judt, who is seated in a book-lined office in an apartment above Washington Square. He says this in a matter-of-fact way. He has been resting a little, as he does for short spells throughout the day. 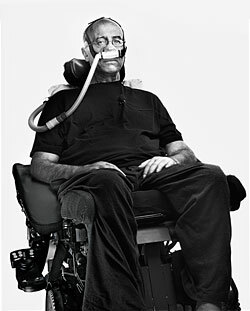 The room is very warm and quiet, save for the whirring of the air pump that keeps his diaphragm functioning and his labored intake through the bi-pap valve embedded in each of his nostrils. Three large computer monitors stand adjacent to one another on a long desk. They run a looped slideshow—snapshots of Judt walking with his wife, clowning around with his children, wearing various styles of glasses (square and clunky giving way to round and sleek), sitting in a chair with an arm draped casually across its back. Now Judt excuses himself and very patiently gives instructions on how to make sitting upright, for a time, bearable. Just a little bit forward with the legs, please. All right. Now—up—and back. His nurse, a sturdy man with a black ponytail, wrestles with the electronic knobs that control the many moving parts of his wheelchair. No—up, as far as it can go. Far as it can go. That’s right. Just a little bit down. And now back. That’s right. Judt requires the assistance of a microphone to be easily heard, and the speaker crackles with the sound of his sighs. The disease that has paralyzed most of Judt’s body—amyotrophic lateral sclerosis, or Lou Gehrig’s disease—has reduced his voice to a hoarse whisper, though it still retains the distinctive rhythms and intonations that made it, until recently, a commanding instrument. Judt is, by common assent, one of the most eloquent and erudite public intellectuals working today—“one of the great political writers of the age,” in the judgment of the political philosopher John Gray. He presides over the Remarque Institute at New York University, where he supports research, schedules lectures, and shapes the direction of European historical studies. He has written eight books on the history of politics and ideas in Europe, and is a famously tough-minded and combative writer of essays, reviews, and op-ed pieces. All in all, he is one of the most admired and denounced thinkers living in New York City. He went on to invite his readers to imagine deleting their ability to move their arms and legs from various daily settings—to scratch their hand, or shift position at night—and consider the effect this would have on their morale. Morning, he wrote, brings “an occasion to communicate with the outside world and express in words, often angry words, the bottled-up irritations and frustrations of physical inanition.” By the time he refers to his “cockroachlike existence” of “humiliating helplessness,” his simple thought experiments have posed a paradox: How can a man enduring the unbelievable torment described within the essay have retained the clarity and poise to have written it? To some extent, Judt’s Iraq essay could be read as payback for the sharp exchanges that had occurred three years earlier in response to another bombshell he had thrown. In an infamous article in The New York Review of Books titled “Israel: The Alternative,” Judt declared, “The depressing truth is that Israel today is bad for the Jews.” For Israel to remain a Jewish state, he wrote, it would be all but impossible to remain a democracy: The demographics of “Greater Israel” (which includes an overwhelmingly Arab population in the occupied territories) will soon make this logically impossible. Yes, Israel could dismantle its settlements, but this appeared to Judt a fantasy: “Many of those settlers will die—and kill—rather than move.” Or Israel could forcibly expel its Arab population, “but at the cost of becoming the first modern democracy to conduct full-scale ethnic cleansing as a state project.” The alternative Judt floated was to establish Israel as a binational state—in effect, to give up on the Zionist project entirely. ALS causes the neurons that connect the brain to the spinal cord and the spinal cord to the muscles to degenerate. The brain loses the ability to control movement. The muscles atrophy and die. Judt was diagnosed in September 2008, and the rapid deterioration of the large muscles in the lower part of his body set in soon afterward. Before his diagnosis, Judt had just begun imagining his next magnum opus, a follow-up to Postwar that would trace the history of twentieth-century social and political thought. These plans fell by the wayside—“Reality is a powerful solvent,” he says—and in November 2008, the Yale historian Timothy Snyder proposed, in its place, that they collaborate on a series of interviews ranging across the breadth of Judt’s career. Their discussions took place against the backdrop of Judt’s rapid decline. By January 2009, he had lost the use of his arms. By March, his legs began to fail. He was on a respirator by May. “Without actually saying ‘You’ll be dead next month,’ ” Judt remembers, “the doctors said, ‘This is very fast. It’s unusual.’ ” Every week for five months, Snyder interviewed Judt for hours on end. “We wanted to get enough material for Tim to finish up on his own in case I was not able to do it with him,” Judt says. Soon after they finished their project, in May, a remarkable thing happened: Judt’s health stabilized. The large muscles in most of his body were long gone, but the small muscles that control eating, speaking, and swallowing remained unaffected. They could go at any time and take him with them, or they could last a long time—months, even years. No one knows why his body stopped degenerating, or what happens next. The interview sessions with Snyder awakened in Judt the urge to start writing again, and to make some noise. In June, he returned to print for the first time since his diagnosis with an op-ed in the Times warning that if Obama failed to follow through on his call for a settlement freeze in the occupied territories, “the United States would be humiliated in the eyes of its friends, not to speak of its foes.” In July, he wrote a eulogy for the left-wing Israeli journalist and historian Amos Elon in The New York Review of Books, contending that Zionism has, “for a growing number of Israelis, been corrupted into an uncompromising ethno-religious real estate pact with a partisan God.” Here was the old Tony Judt, renewing the old polemics. He was not backing down an inch. In a sense, it is Judt’s continued engagement with the world that has kept him sane. In order to pass the time at night, he has trained himself to enter into prolonged reveries: He organizes various memories into “a Swiss chalet,” placing certain thoughts in certain cupboards, and different examples in different shelves. The mnemonic device has worked well enough that he can wake in the morning and dictate the first draft of brief autobiographical essays, which he would send as e-mails to friends. They are now published as a series in The New York Review of Books, and will eventually be collected into a short book. In August of last year, Judt found himself planning out the agenda for the Remarque Institute. He told the dean of NYU that he intended to give a seminar about social democracy—its problems and its prospects today. In response, the dean suggested he consider making it a public lecture. Samuel Johnson famously likened women preachers to dogs walking on their hind legs: “It is not done well; but you are surprised to find it done at all.” As the audience gathered at the Skirball Center at NYU one night last October—nearly 1,000 people, including much of New York’s intellectual community—there was considerable unease in the air. It was Judt’s first major public-speaking engagement since his diagnosis. Would this famously articulate speaker, rumored to be afflicted by a dreadful sickness, even meet the Johnsonian standard? “We did not know what to expect,” says the Columbia University historian Istvan Deak, who had collaborated with Judt in the past. “We were worried about whether he would be able to speak at all, and how painful it would be to see this terribly ill man.” Judt himself knew that his mental capacity was undiminished. Still, he would be unable to take a drink or be adjusted if his body grew uncomfortable, and the logistics of having someone join him onstage to turn the pages of his notes were tricky enough that he decided to memorize the entire lecture. “It would have to be a pure adrenaline-driven performance,” he remembers. After a fulsome introduction by the dean, Judt was wheeled onto the stage, accompanied by his breathing apparatus and swaddled in a black blanket. He looked ancient and regal and slightly unearthly; his head was clean-shaven, his nostrils distended by the bi-pap valves. Alone onstage, Judt had only two resources to draw on: his words and his will. But they were sufficient to keep the crowd enthralled. The speech has had a prolonged afterlife. It was published in The New York Review of Books last December, and Judt worked quickly to expand it into a longer essay, which then aroused the interest of the Penguin Press, who encouraged Judt to expand it further. Judt calls the resulting book, Ill Fares the Land, “an essay on the possibility of living differently.” It was rushed to press, and will be released next week. “You’re going to find this weird,” Judt says, “but the thing I do best is teach.” He considers his role as teacher to be more important than his work as a historian or public intellectual, and he has received hundreds of letters from former students over the years expressing their gratitude. Last spring, Judt taught an undergraduate class in his living room, and since then he has continued to teach a graduate seminar and the occasional individual student. One Wednesday last month, as a blizzard blankets Washington Square, Judt is helping a second-year graduate student, whom we will call Gabrielle, construct a dissertation reading list on Jewish history. Gabrielle is a fresh-faced woman in her twenties who speaks with a French accent. They settle into an easy rapport, readily interrupting each other and finishing each other’s sentences. “So, how many books … ” asks Gabrielle. “Should we do in toto? Look, if the choices are between 20, 50, 100, and 500 … ” Judt begins. Their talk ranges across the whole of European Jewish history—Eastern, Central, and Western Europe, the Sephardim, the “port Jews” living in places like Salonika and Alexandria. They arrange to meet weekly to plow through the reading. After a while, they turn to more personal subjects. “I cannot resist Cambridge people,” Gabrielle confesses. “That’s a bad basis on which to select anything—husbands, boyfriends, whatever,” says Judt with an amused nod of the head. “I know!” Gabrielle says ruefully, shrugging. It is the fate of every strong, indomitable personality to confront his or her own decline, and no one, it seems, has done so with harder lucidity than Judt. “Nothing prepares you to die,” he says. “I imagine it helps if you are profoundly religious, if you absolutely, unequivocally believe that there is a purpose to all this, and that you are going to go somewhere nice. I don’t believe either of those things. “I thought of this as a stroke of catastrophic bad luck,” Judt explains. “Neither unjust, because after all, there is no justice in luck; nor unfair—‘Why me and not you?’—which would be a ridiculous way to think of it; nor implausible, because it’s so implausible that plausibility is off the scale. Nor does it have meaning: One thing I always felt very strongly empathetic about in my reading of [the Italian chemist and Holocaust diarist] Primo Levi was his absolutely clearheaded sense that none of what had happened to him in the camps had any meaning. You might draw lessons from it in terms of experience, you certainly might draw political lessons. But at the existential level of one man’s life, it had no meaning. This has no meaning. What I do with it is up to me. “History can show you that it was one pile of bad stuff after another. It can also show you that there’s been tremendous progress in knowledge, behavior, laws, civilization. It cannot show you that there was a meaning behind it. And if you can’t find a meaning behind history, what would be the meaning of any single life? I was born accidentally. I lived accidentally in London. We nearly migrated to New Zealand. So much of my life has been a product of chance, I can’t see a meaning in it at all. I can just see the good stuff that happened and the bad stuff.